Steve joined BND Commercial as part of the Goldstine Knapke acquisition in August 2010. 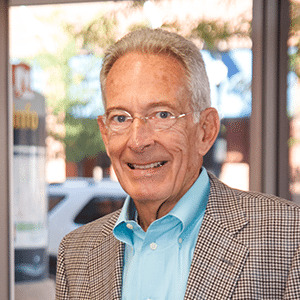 He began his career in commercial real estate in 1962 and has served the northeast Indiana market for more than 50 years. Steve is a graduate of Indiana University with a Bachelor of Science degree in Business and a concentration in real estate. He is involved with several professional organizations, including the Indiana Commercial Board of REALTORS® (ICBOR), Northeast Indiana Commercial and Industrial Brokers and the National Association of REALTORS®. As an active local volunteer, Steve serves as board president for the Robert Goldstine Foundation, which provides funding for economic development, the arts, civic projects, human services and, in general, strives to make Allen County a better place to live and grow a business. He has previously served on the Trustee Board of Directors for the Boys and Girls Clubs. Steve has been married to his wife, Keitha, for nearly 55 years. They have two sons and three grandchildren. He, along with both his sons and both his grandsons, have achieved the highly respected designation of Eagle Scout. Steve also enjoys all water sports and is an avid in-line skater.